Military contractor Brian Gilcrest (Bradley Cooper) is hired by billionaire Carson Welch (Bill Murray) and is called to Hawaii to broker a deal with King Dennis "Bumpy" Kanahele (himself) to bless a military building location that used to be a native burial site. As a private citizen, Brian must be escorted everywhere by his military liaison, Captain Allison Ng (Emma Stone), who he becomes quite taken with. He also reconnects with an old girlfriend named Tracy (Rachel McAdams), who is now married with children, living in Hawaii, and has unfinished business with Brian. 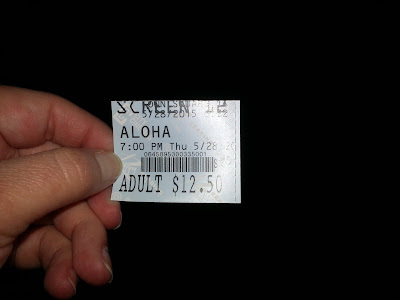 Just about every movie we have seen in the last couple months has had the "Aloha" trailer attached to it to the point where we could recite it word for word. We do have to admit that we were pretty excited to see this flick considering its incredible cast and the fact that it was directed by the talented Cameron Crowe, who we have loved in past projects. The people who had a hand in crafting the trailer for this film really did a good job of making it look like a good movie. Then we saw the actual final product and wondered, "where was the film we were promised?" To say "we didn't like X movie because it wasn't what the trailer promised" is a cop out and something we hear quite a bit from critics and fans alike. We are often guilty of complaining about trailers themselves because they can spoil plot points, or be too vague, or in this case, be representative of nothing like the actual film at hand, but we have never based our ultimate review and thoughts on a movie based on what the trailer said. In this business, you simply have to assume things are spliced and fudged and altered since they are selling points to put butts in seats and make tons of money. Besides, why would studios want to produce crappy trailers? Ask the people who woefully mislead the public in making the "Aloha" trailer. When you strip all of this away, we left the theater very disappointed with what we had just seen and it has nothing to do with the trailer. This is just a bad movie and one that, realistically, probably should have never been made. After being outted as a major topic of conversation in the 2014 Sony email hacks, even the producers of this film said it was a stinker, and folks, they were right. The biggest problem falls square on the shoulders of writer and director Cameron Crowe, who has seen his fair share of flops as of late. The story and the telling of it is just sloppy, there's no other word for it. It's part romantic comedy, part romantic drama, and then there is a weird subplot about a billionaire civilian trying to smuggle a nuclear weapon into outer space without anyone knowing. On top of all of this, weaved throughout the course of a sometimes grueling 1 hour and 45 minutes are stories about Hawaiian mythology and Hawaiian culture despite the fact that the primary cast doesn't include anyone who is native Hawaiian. There has been some controversy online about this, too, which we mostly brushed off until actually seeing the end result. The movie can't have it both ways. To us, we think it cannot espouse Hawaiian stories and mythology, or as Crowe himself put it, be "a love letter to Hawaii," focusing on the culture, values, and beliefs of the Aloha State and its people, but be told by someone who is not Hawaiian. It just doesn't add up. Emma Stone's character is named Allison Ng, and she goes on to state that she is 1/4th Hawaiian. What? Would it simply be too much to ask that this character be cast as a person of color? It's really not that hard to figure out. There are individual parts in this film that are good. There is a great cast including Bradley Cooper, Emma Stone, Rachel McAdams, Bill Murray, Alec Baldwin, John Krasinski, hell, even Danny McBride, who we aren't typically fans of, but it's as if there was so much talent involved, Crowe didn't know what to do with all these great actors and just started throwing stuff at the wall to see what stuck. John Krasinski was our favorite part of the movie and he has less than 10 speaking lines total. Emma Stone and Bradley Cooper just didn't connect with us as a couple and we didn't get invested in their relationship at all, mainly because we didn't believe it or in it. Though McAdams and Cooper formed a much more believable, emotional bond, this was not the focal point of the story. There are some good individual lines in this film, but when put in context, they are out of place and unnatural. It's like Crowe had this pseudo-philosophical line in his head that sounded good on it's own, but he couldn't make it sound natural in an actual conversation, so he just made a character blurt it out with little to no reason or prompting, which makes it seem so out of place. It doesn't just happen with dialogue, either. There are many times while watching this film where a scene or situation just doesn't fit, and we were left thinking, "why is this here?" Many scenes feel as if they were supposed to be part of a different movie. This is most certainly a case where the individual parts are worth far more than their whole, because when it was all brought together, it's a complete and total mess. We can't even say it was hasilty slopped together, either, because Crowe spent 8 years making this movie. 8 YEARS!! I would be pissed as hell if I had dedicated so much time and wasted so much of my life on a project that basically felt like something a 4th grade cut and paste together for home room the night before their project was due. This is one of the biggest disappointments of 2015 to date and will probably be on our list at the end of the year. As we said, BigJ and I were really looking forward to this movie and left wholly unfulfilled. At the end of the day, "Aloha" is a movie that should have never been made and we're baffled why Cameron Crowe didn't at least attempt to tweak it after such negative criticism from executives and fans alike. It's dopey, senseless at times, unbelievable, devoid of any chemistry and emotional punch, and features a bizarre series of rambling mythos stories and plot points which makes it seem like it was 3 or 4 projects wrapped up into one untidy package and haphazardly thrown under the Christmas tree, because it does take place during Christmas. What I like about Cameron Crowe’s films is he tells a story, and I really don’t think anyone blends music into movies better than he does. 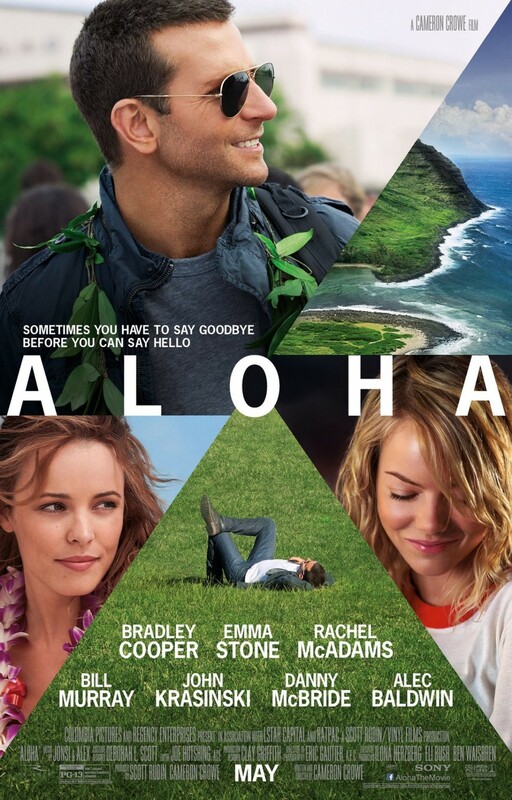 While I do like the way he write his stories and uses music as a tool to tell his stories, Aloha was just plain awful. Like, WOW awful, not just a little bit. Emma Stone as a partially Asian character was a huge mistake.